“Full moon shinin’, shinin’ big an’ bright, Pushin’ back the shadows, holdin’ back the night.” One ‘skinny kid with questions in his head’ sneaks into the barn in the middle of the night. There’s the scarecrow leading all the animals to a hoedown with his fiddle. Once the dance begins, the boy can’t help but join in the fun until the light of day sends everyone home again. 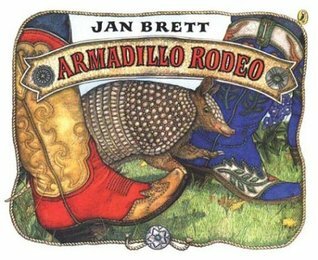 Mama Armadillo had a hard time keeping up with Bo. Her other three babies followed along right behind her, but Bo kept getting distracted by bees, lizards, and now a pair of bright chili-pepper red cowboy boots. These boots belonged to Harmony Jean who was on her way to the rodeo, and Bo just had to follow them… he was in love! After the horse riding and picnicking, Bo followed his new friend into the barn for a little dancing. He two-stepped right on over to her and cut in. 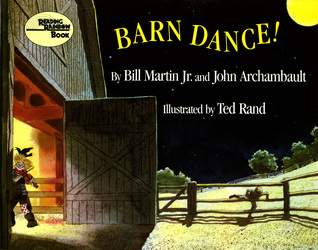 But when Harmony Jean went ‘tap-slide-tap’ and ‘heel-stomped’ then ‘high-kicked’, Bo was hurled far away from the dancing and landed in a hayloft. Harmony Jean slipped off her boots at the campfire just in time for Bo to introduce himself. ‘Howdy’ he said, but the chili-pepper red boots didn’t reply. So Bo stuck his head inside the boot and took a long sniff… that didn’t smell like an armadillo! Bo backed away and returned home with his Ma and his three armadillo brothers. 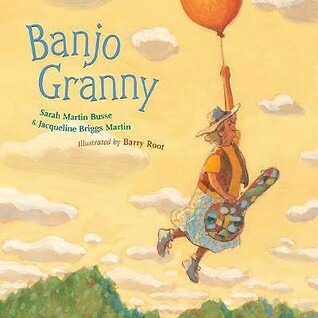 Owen’s granny picked up her banjo and set out across a river, a mountain, and a desert to see her giggly-wiggly grandbaby. Owen knew his granny was coming and he waited by the window all day until she arrived. Granny played music for the river, the mountain, and the desert so she could cross quickly and safely. And when Granny finally arrived she picked him up and gave him one huge hug. Then she took out her banjo and sang her Owen-song for him. They both went ‘wiggly, jiggly, all-around giggly, and tip over tumble for bluegrass music’.